"This is the 1999 American Pie Council's National Pie Championship second place winner in the Cream Pie Category." In a medium bowl, mix together graham cracker crumbs, 1/4 cup white sugar, and melted butter. Press mixture firmly in bottom of a 9 inch pie plate. Bake at 375 degrees F (190 degrees C) for 6 to 8 minutes. Combine 2/3 cup white sugar, cornstarch, and salt in saucepan. Blend milk and egg yolks; gradually stir into sugar mixture. Cook over medium heat, stirring constantly, until mixture thickens and boils. Boil and stir 1 minute. Remove from heat, and stir in butter, vanilla, and pineapple. Pour into crust. Press plastic wrap over top of filling. Chill at least 2 hours. 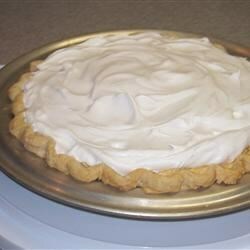 In a large mixing bowl, combine whipping cream, confectioners' sugar, and almond extract. Whip to stiff peaks and pipe or spoon onto pie. Serve immediately. DO NOT use fresh pineapple in this pie. There are enzymes in fresh pineapple that break down the custard. That's why AMELIAJEAN had so much trouble. Found this pie on the bland side. (I am a pineapple lover). I will add 1/2 cup of the pineapple juice and decrease the milk by 1/2 cup for my next attempt. Wonderful recipe! I did not make my own whipped cream, instead I bought extra creamy whipped topping and added almond extract. Oh my gosh, so yummy.